Two years ago I traded a 2000 Toyota Tundra for a 1975 International Scout and have been building the old truck into a manifestation of my fantasies ever since. Specifically, my dream of a jungle-themed Scout on an adventure from Alaska to Tierra del Fuego. That’s where my shiny new hood bird comes in. Let me back up a little here. In my imagination, in the mid-1970s, International Harvester launched a promotional expedition along the Pan-Am highway to celebrate the launch of the long wheelbase Scout Traveler. In this work of fiction that I have so far only written in my head, trucks were painted in wild jungle liveries to look killer on magazine covers. 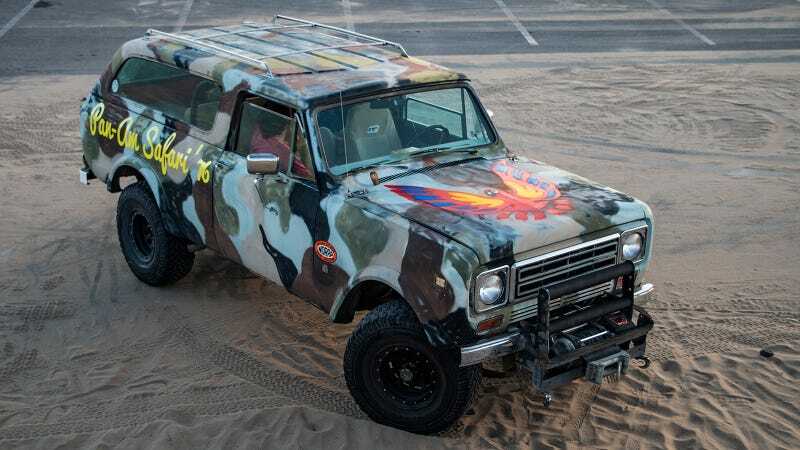 That concept was actually inspired by my truck’s previous owner, who took the liberty of covering the vehicle’s original Omaha Orange paintwork in rattle can camo. At first I hated it, but eventually grew to be a fan and finally decided to just put my own spin on it. Inspiration for the bird specficially goes back to the first toy car I can vividly remember–an orange Pontiac Firebird with a red fire bird on its hood because of course. Ever since, I’ve entertained the dream of having a bird on the hood of one of my own cars and today I finally indulged that fantasy with the help of some artistic talent. Venice, California is just down the road from me and also happens to be a hub for street art. Roll through Abbot Kinney Boulevard or any alley near the beach and you’ll find plenty of colorful murals to look at. At some point I started noticing the tag “Muck Rock,” which is how I found Jules Muck. She does a lot of animals and faces and I really like her style, so I hit her up on Instagram and asked if she’d paint the parrot I wanted on the hood of my Scout. The idea was to do a cartoony parody that was clearly inspired by the Pontiac bird but also clearly a scarlet macaw, which is my second-favorite South American animal. I thought about trying to make this myself, or having it printed as a sticker, but I knew neither of those methods would really get the result I was looking for. On top of that, I like the idea of the truck being blessed with an original piece by an artist I admire. Anyway, she banged it out in less than an hour and I think it looks pretty darn sweet. The proportions are perfect, the colors are crazy-vibrant, and I can’t wait to look at it every time I take the truck out. Maybe I really will drive this thing to the bottom of South America. Look for some better pictures soon, when I can take the truck it out in decent lighting.